FINN.no is Norway’s largest online marketplace. FINN.no is a story of disruption and innovation, and we have a goal of being one of the most innovative companies in the world. We believe innovation is about people and the story describes how we have implemented tools, processes and behaviors to support this goal. FINN.no is a story of disruption and innovation. In the late 1990’s Schibsted decided to start a new online-company, outside the established organization, to really take advantage of the new possibilities given by the Internet. The idea was to move the newspaper classified ads online, and by that enable new revenue streams and business models. FINN.no was founded in 2000 to be that spearhead, and was given the mandate to cannibalize the newspapers business model. Now, twelve years later, online classifieds are a major part of Schibsted’s revenue and FINN.no is one of 20+ companies in Schibsted Classified Media. FINN.no has also succeeded in establishing a revenue model based on people paying to advertise, whereas various competitors offer such listings for free. As a result FINN.no is very profitable with a profit margin above 47%. Innovation is a strong part of our company’s history since FINN.no itself is an innovation. However, when we looked at our large market share in 2006, we saw a strong limitation for further growth. We have also seen stronger competition from global competitors like LinkedIn and eBay, and to some extent Facebook. Because the Internet is such an effective distribution channel, the competition is global and highly dynamic. A startup can become a large competitor within a year, a huge contrast to the old industrial economy. Based on this analysis we decided to gear up our innovation efforts. In addition we are now experiencing a mobile transformation. After 10 years of relative stability in the desktop-world, there is now the whole new ballgame of the multichannel-world. This also calls for a strong emphasis on innovation. To have an external benchmark on how we succeed in building a healthy corporate culture we have participated in Great Place to Work for the last eight years. GPTW measures elements like autonomy, freedom and influence, important building blocks for an innovative culture. We have succeeded in becoming the Greatest Place to Work twice (2011 and 2012) in Norway, and have been listed top 4 in 2006-2010. 95% of all employees say they are looking forward to go to work every day. This serves as a good benchmark, but also as a tool for strengthening employer branding. Feedback given in GPTW is actively used by the management group to adjust and prioritize actions. Since 2010 we have implemented principles in product development as a companywide program. The program has been an important building block in defining the platform needed to support our future innovation efforts (see more in the next chapter, “Future growth”). The program is used for all development teams (20 in total) and is based on implementing companywide product development principles, and allowing locally adapted processes. This has been a success, since locally adapted processes gives the opportunity to be flexible and nimble. There is also less resistance to change if people can be a part of defining their own way of working, framed by some non-negotiable principles. The implementation is run as an internal certification program, owned by organizational development. Certificates are handed out monthly. The implementation-program in itself is voluntary, but has created a pull instead of a push. The product development principles are based on Lean. We believe Lean and Innovation can coexist, and we use Lean as a mindset for continuous improvement, not continuous cost-cutting. The benefits from working lean are that resources can be freed up and transferred to creating more radical innovations. Based on our values we want openness and crowdsourcing of ideas to harvest the collective creativity of the organization. In 2007 the decision was made to develop an online Idea Management tool, FINNopp (meaning “Invent” in Norwegian), since buying a tool from a vendor was found to be either too expensive or lacking functionality. The tool was developed with social functionality such as collaboration and voting. The solution quickly became a success and generated huge numbers of ideas. Transparency and passion for ideas are levers for strengthening the innovation culture since all employees can vote for ideas they want the management group to prioritize. A new category for tendering services was one result, with a turnover of 40 million NOK in 2012, as well as a new brand, www.penger.no. Ideas that are selected are given resources to develop and launch. One of the success-criteria of FINN.no is the collaboration with strategic partners in real estate and car sales. Several innovations have occurred as a result of close cooperation with industries in chosen categories. Open innovation has been on FINN.no’s agenda from the start. To strengthen the communication with the users of FINN.no, we launched FINN Labs as a portal for communication and collaboration with the user community. FINN Labs contains information for tech buffs, such as which devices and operating systems are used to access FINN.no, but also for a wider target group. We post ideas about future products and gain feedback from the FINN-community to enhance our product development. Users of FINN Labs also get the opportunity to be beta users. FINN Labs had 80 000 unique visitors in 2012. To strengthen the innovation culture and to foster an intrapreneurial skillset we have launched two concepts: FINNovation day and Sandbox. FINNovation day is all about creativity and playfulness. All employees can attend. Everyone is grouped in two main groups: the ones having ideas and the ones with capabilities to develop ideas further. The output can be ideas and concepts that can be implemented, but the purpose of the day is mainly to offer a training ground for skills and behaviors. Either you are trying to “sell” an idea or help nurture and develop an idea. FINNovation day is held twice a year. Sandbox is a concept that allows employees to develop their own products based on data from FINN.no. FINN.no, being an online marketplace, has lots of user data and Sandbox enables the use of some of these datasets. Employees sign a contract with FINN.no allowing them the use of data. When a product is launched, any revenue is split 70/30 (Employee/ FINN.no). Sandbox may foster competitors to FINN.no, but we believe that the benefits of intrapreneurship overshadow the fear of competition. This fall, the first solution was launched and is available in Apple App Store. Establishing innovation key indicators is not an easy task. All indicators have an inherent risk of creating adverse effects. FINN has learned this the hard way. We have arrived at a set of KPIs that we believe are better balanced and more stimulating than the original setup. Improve the set of KPIs continuously. Establishing an appropriate set of KPIs is always difficult, and it is practically impossible to find the perfect set. The way we measure and manage innovation must be subject to improvement based on how well they work in real life. The key is to measure frequently and improve the set of key performance indicators continuously. The efforts described in the previous section were/are all important parts of our current innovation standpoint. Because of an ambitious 2015 growth target, but also due to a competitive multichannel environment, we have decided to strengthen our efforts even more. We have defined a new innovation strategy based on our new corporate strategy. The purpose is to clearly define innovation in a FINN.no context and to give direction to where we shall search for innovations. The strategy also gives direction to which tools and processes we shall improve and which new to implement. 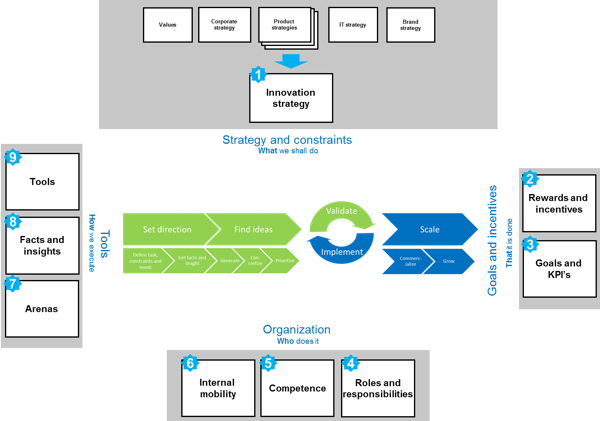 The innovation strategy is owned by the top management group. The innovation strategy is tied to the growth targets of FINN.no to give a strong rationale that innovation will fuel growth, both incremental and radical. FINN.no recently reorganized the whole company. The main reason for the reorganization was to “accelerate the innovation pace”. FINN.no has previously been organized around decentralized teams based on the different categories (real estate, cars, jobs etc.). This accelerated incremental improvements of the current product, but slowed the ability to make radical changes across teams. Now the company is organized around functions such as Sales, Product and Technology. Another result is a smaller top management team and a clearer governance structure. Another issue is our principle of “Mobile First”. As described in earlier chapters we experience a change in paradigm, much the same as we experienced when FINN was established. Back then the paradigm was about the change from paper-based to digital classified ads. Now we see a change from desktop to mobile. 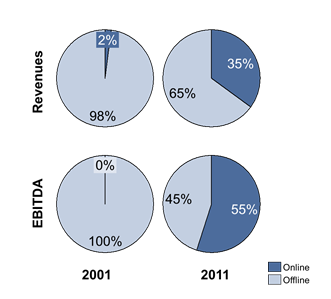 As we experienced then, user behavior shifts more rapidly than business models. Even though: we must adapt to user behavior to have a business model tomorrow. “Mobile first” is therefore not a question of technology but a question of future competitiveness. The change in organization was made to better cope with this challenge. The direction, tools, processes and concepts described in the previous chapters constitutes the innovation platform on which the organization shall find support to act. The responsibility for understanding trends, users and competitors and to use this insight to generate ideas, develop and launch lies in each business area. The current business areas, made up of all current marketplaces, are primarily responsible for incremental innovations. To succeed with more radical innovations, and enable the right environment, focus, people and processes, a NewBiz-team was established in April 2012. It´s a team with few dedicated people responsible for finding and selecting the best opportunities for FINN.no, building investment cases and through Lean Startup and entrepreneurship ensuring optimal start-up and implementation. An important element is that the team has the full responsibility both in selecting the best cases and building the product and organization needed to take the business case to market with focus on KPI´s related to growth. We have found some challenges with Idea management that we have set out to fix. Our fix to these challenges is to take a step back and clarify and redefine processes, roles and responsibilities (especially how we prioritize tasks and resources). We also have piloted offline tools, like ?WhatIf!, to improve skills needed to come up with more radical ideas. As a result of this work we will also revise our Idea Management tool. As a part of the principle of continuous improvement the release frequency for FINN.no was changed from a quarterly to a three-weekly basis. This had two major effects: 1) the fail rate after release was reduced by 75%. This was mostly due to reduced complexity. If product development is forced to release features in smaller batches, the complexity and number of errors in the code are reduced. 2) If features are released with a higher frequency it is possible to get more user feedback. This feedback can be used to learn more about what will provide user value or not. This is particularly important when working on new innovative products. A rapid user feedback can give valuable insight and the possibility to pivot. One effect of using the Lean Startup Methodology is that the process of funding new ventures gets very lean. The last idea for a new category, generated in the New Business Development team, took three weeks from initial idea to approved funding by the board. To succeed in making innovation a part of the DNA, innovation must be demystified and decoded. Inspired by Doblin, we have defined innovation as “A viable new business concept”. We want innovation to be broader than product innovation and have used examples from FINN to clarify what “other than product innovation” means. It is difficult because revenue models, brand, processes and customers are more difficult to grasp than a product with features and attributes. Product development, which is in charge of innovation, also has had a product feature perspective on innovation. One key activity we have started is to involve sales and make them feel more involved in the innovation process. The sales department has now established a Concept-team responsible for customer involvement (open innovation) and crafting out ideas that goes wider than traditional product development. We have also hired a person in the business development team in charge of pricing and revenue-models. He is used also used as a sparring partner to broaden the perspective of new business models. The role of FINN Way of Innovation is to make sure that all these stakeholders and contributors are involved in our innovation process at the right time. Another way of decoding innovation is to talk about problem-solving and user needs, not innovation. We aim for an organization that solves user needs and problems better than anyone else. Some of the needs and problems calls for innovation, but not everything we do will be defined as innovation (based on our definition). We work with tools like A3 and “5 why’s” to find root causes and solve problems and work with change management to be able to cope with a rapid changing environment. Not all root causes calls for innovation, but problem solving gives the organization skills and behaviors that can be used in the innovation process. Innovation can be enabled by technology, but must be achieved by people. Even if we are a part of a tech-intensive industry we firmly believe that technology alone cannot achieve what we aim for. FINN has 100+ developers, but also 100+ salespeople. Even if we attract the best developers our competitive advantage in many ways lies in our ability to build face-to-face relations with our customers and truly understand their needs. The internet is a highly effective distribution channel, but it also enables users to migrate to other solutions quickly. Relations cannot only be made and managed online. In addition to all the company-wide efforts described in the previous chapters, we therefor see our sales staff as a tool to succeed with innovation. The prerequisites for innovation must be understood by managers on all levels. Management principles must support innovation. As described in previous chapters we see a link between values-principles-processes. Previously we had an organizational structure that amplified suboptimal behaviors. In this perspective there was a wide range of management principles and behaviors. This was a good strategy in a growth-phase, but the profound challenges we now face calls for a stronger “FINN first” principle than before. We now have a smaller top-management team with more intertwined goals, and a smaller level 2 management group with more defined responsibilities. By implementing the revised product management principles described earlier we hope to get a stronger focus on a common set of management behaviors that support innovation. I think some of the most interesting things about FINN is how open the organisation is, both in social media, in sharing ideas and telling what will come next. Its fantastic to follow people from FINN in social media. FINN definitely holds a lot of unique expertise, that others could learn a lot from, and it seems obvious that innovation in FINN is not random. Keep up the good work! What impresses me is that FINN.no have understood that to be good in innovation, you need an effective organization as well (to be able to execute). Many organizations have Innovation departments that are fighting to be prioritized over daily operations. And if daily operation struggles, innovation will always loose. The Idea Management Tool is a great example of not only crowd-sourcing ideas, but also instilling a sense of ownership among employees. FINN.co has figured out how to generate and implement. Thanks Stephanie! We made some early successes and have, as descibed in the story, also learnt where to improve.